Chapter 5: "The Thousand Fangs Below"
All the danger of Saventh-Yhi, the jungle city lost from the modern age, pales before the terrors that lurk below its shattered streets. Beneath the ancient ruins rots a realm of darkness and monsters over which Saventh-Yhi long stood guard. Into the eternal night of that realm below the adventurers delve, coming face to face with the degenerate inheritors of a lost empire, fiend-worshiping denizens of the dark, and the zealots of a decapitated god, all in the hope of saving Eando Kline, one of the greatest explorers the world has ever known. But even if they can manage to free Eando, will the PCs be able to escape his captors, the fanged legions of the serpentfolk? Four new monsters of the jungle, by Jesse Benner and Sean K Reynolds. 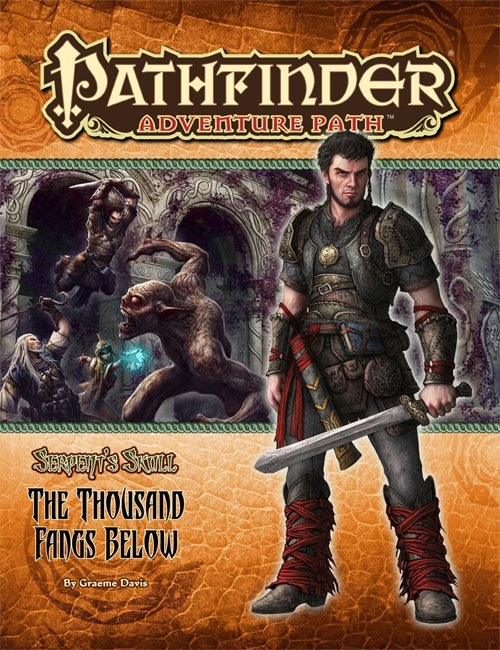 The Thousand Fangs Below is sanctioned for use in Pathfinder Society Roleplaying Guild. This adventure focuses on the PCs exploring an ancient, ruined city. Which is precisely what they were doing two adventures ago in "City of Seven Spears." Thankfully, the underground city of Ilmurea feels far different than its counterpart in the world above, which means there's little chance players will be feeling much deja-vu. The primary adversaries in "Thousand Fangs Below" are serpent people, and the PCs will be slogging through a small army of them. Fortunately there are a variety of other enemies such as morlocks, gugs, drow, intellect devourers, and daemon-spawned urdefhan to keep things feeling fresh. There are also several opportunities for diplomacy, intrigue, and shady alliances here, leaving sneaky or socially inclined characters with plenty of chances to shine. I would also like to compliment the maps in "Thousand Fangs." The cartographer did an excellent job with Ilmurea, and the serpent people's fortress (the titular Fortress of Thousand Fangs) is well done. It's essentially an enormous, coiled, hollow stone snake - really cool in other words. There are four new high-CR monsters in the bestiary. Three of the beasties come from African mythology, while the fourth is the mysterious herald of the magic god Nethys. All four monsters were unique and interesting. Speaking of Nethys, he gets a full write-up in "Thousand Fangs" as well. The author, Sean K Reynolds, is known for his excellent treatment of deities, but I found this article to be among his weaker pieces. Nethys came across as a bit bland. Yes, I understand that he encourages his followers to learn/create/use magic, but to what end? I thought the previous look at nature deity Gozreh, back in "Race to Ruin", was a much more intriguing piece. Oh well. To round out "Thousand Fangs," we have a gazeteer of Ilmurea - the city in which this adventure takes place. There are some great adventure hooks to be found here, and a creative GM could keep his players occupied for many hours exploring this nifty set piece. All in all, this is a well done penultimate adventure. Graeme "Warhammer Fantasy RPG, 1st Edition" Davis ? Well, the PCs ally with the Pathfinder Society from the beginning. Somehow, in reading this adventure's description, I imagine a venture captain muttering "They're coming to get you, Eando." Yeah, it's totally Eando Kline. Not necessarily. We'll be setting it up so that the PCs get to choose their allies. And none of them will necessarily be "the right" choices. You could very easily play this AP wiht the Pathfinder Society as the bad guys. Graeme Davis that's a name I haven't heard in quite a while! And an author I'm definitely keen on having a Pathfinder adventure from! I've worked with Graeme once before; he wrote a Freeport pirate adventure for Dungeon Magazine back in the mid 100s somewhere. I'm REALLY excited to get him on the AP line! Me too! Or I'm excited to see it happen! For those who don't know, Graeme really helped put Warhammer Fantasy RPG on the map. He's going to add a really cool and distinct flavor to any AP. You stole my words, that guy is a legend!!! And a nifty green cover to boot. Speaking of covers, I really like the purple background you use for temporary cover pictures. Any chance of seeing that as an actual background for one of the paths ? Oops... that first fragment was actually a remnant of the description of #40. I've removed it. Thanks! Any chance the Nethys article will include a prestige class to extend the Mystic Theurge for four more levels? Nope. No chance at all. The point of the Mystic Theurge class is that you trade off those four levels in return for getting to play two spellcasters at once. I had kind of imagined a prestige class with a prereq of spell synthesis that would work like the old Archmage or Hierophant, granting +1 level of a spellcasting class and the menu of weird abilities for spell slots, actually. I guess I should have been more specific. After all, any cleric of Nethys with 10 levels of MT is probably no more than 1 feat away from being able to go Loremaster for levels 19-20, and maybe earlier if they plan ahead and pick up that skill focus early, and have the faster spell progression classes as the stuff prior to MT. While on the subject of Nethys, though, any details on ruincasting, the Magaambya and the tempest-sun mages in this AP? There are a lot of numbers in the names of this AP. Since you already have "Thousand" in #36 as well, I wonder if the Azlanti theme would be better served with "Myriad." Is it too late to change? Would you say there is a PLETHORA of fangs below, Jefe? i'm really looking forward to this one. i've really loved Mr. Davis' Freeport work. I'm sure the adventure will be good; I'm just worried that folks might get the idea there's a one-to-one, onto correspondence between this and #36. Like this one will be The Revenge of The Cosmic Dentist, with 1 scream per fang. That would be an unusual logical leap, since the two volumes are separated by about a half year of time and are in different Adventrue Paths. It's already been solicited, in any event, so while it's not too late to change the title, it's not likely to happen. In any case, "The Myriad Fangs Below" or "The Plethora of Fangs Below" don't sound NEARLY as evocative as "The Thousand Fangs Below," if only for the loss of the TH consonance between "The" and "Thousand" and the S consonance between "Thousand" and "Fangs." What about: A Lot More Than Thousand Fangs Below, Possibly Even a Myriad Fangs Below! I like "The Ventral Kilofang"
I wonder if there is any truth to that rumor? None whatsoever. There's no underwater stuff in the adventure. The cover image and description have been updated to match the finished product. I think I bought Graeme's work back in the mid-nineties, purchased the six-part series for The Enemy Within Campaign, and fell in love with a game that totally trumped our 2nd edition game at the time. Now you say his name and I have the same reaction as when I hear "Monte Cook is in the house!" Paizo is awesome at snapping up great writers. The chick on page 45 has a really freaking long tail. Not so loud—she's sensitive about it. Dungeon 107 - a really really good adventure, that I have used to start my Freeport campaign in Greyhawk. Can't wait to read his newest opus (i.e. "Thousand Fangs Below"). Didn't he write the Adlerweg modules a long time ago for AD&D? I think "The Sentinel" and "The Gauntlet". Screw D&D, Graeme Davis is THE man when it comes to Warhammer RPG and several White Wolf books. He wrote some of the best early Vampire books and Wraith: Oblivion. Also, GURPS. I'm so excited that this legendary person is writing a Pathfinder module, wohoo ! Geez, this is an amazing adventure - probably my favorite since Sound of a Thousand Screams. 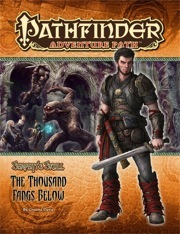 Hopefully Paizo can get Graeme Davis on board for more projects. A question on the Nethys article: How does this affect the classes of the APG? I'm planning on allowing Witches, Summoners and Inquisitors to use the new spell and the revised spell list simply because given the description of Nethys I can't imagine them not being equally welcome. Just raising it as a point of interest. You can as well as forget about these, they're going away from Carrion Crown on. Apparently the only reason for their existence was for folks to argue over stats. Ah, I remember there being some discussion about that, but I didn't know it had been finalized. Not quite true... although that's certainly ended UP being the main reason. Is it me, or that front cover art of Kline look like something that would be found on a video game/MMO? This one, especially, caught my eye. Since fantasy MMO video games tend to use the same style of art we do (and in some cases, the same ARTISTS we do), I suppose it's not surprising. I don't play video games and MMOs. I've been inundated recently by various game PRs to review and posts so that's probably why I noticed the cover. It was actually the face that caught my eye. Reminded me of some of those shoot-em-up characters in video and MMOs games. Anyone else notice that Nethys didn't get a portrait in his article like the other gods. Instead there was a picture of a lady rocking the half-face. That was a mixup at the art order stage—the picture of Nethys is the half-page horizontal opener at the start of the article, while the picture of a cleric doing her thing is the vertical one. Oh! Thought Nethys just assumed a female form.